Home › Member Farms › A trip to Bickleigh Mill is a must! Bickleigh Mill, near Tiverton, combines an artisan shopping experience, fine dining and a base for local recreational activities all in a picturesque environment. The building itself, is an historic 18th century working water mill and is open 7 days a week from 10.00am. The gift shop sells a treasure trove of items to delight both young and old – framed prints, clothing and accessories, jewellery, home furnishings and traditional toys and crafts to inspire the children. The bistro bar and restaurant is open from 10am – 5pm every day and later on Fridays and Saturdays throughout the year. It serves a variety of light and main meals, also catering for vegetarian and gluten free diners and offers the best in seasonal produce, all sourced from local suppliers and delivered fresh to the Mill. 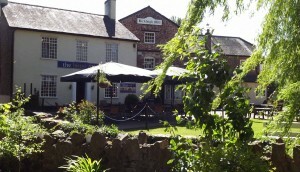 Bickleigh Mill is situated between Exeter and Tiverton in the Exe Valley. Set in 10 acres of land, the Mill has its own waterways and walks that can make your visit complete. For any outdoor enthusiast this idyllic setting is a must and there are many other local attractions within a short distance. ‹ Extend World Book Day and hibernate with a good read!